The one thing I’ll never compromise on is my child's happiness. This may seem like stating the obvious, but hear me out. Of course, we want our children to be happy. But do they know what makes them happy? Or do they do things that make us happy? What I'm trying to get at is that there are many things I want Little Dude to learn about life, but the one message I want to get across to him is: Follow your heart. This isn't just a mantra, but a skill that we need to teach our kids. It is the skill of making decisions for themselves. Yes, they should considerate and thoughtful to others, but for decisions that involve important aspects their lives, they should listen to their heart. As parents, it's hard not to have expectations from our kids. But come to think of it, how many of those expectations did our parents have from us? Are we just following premeditated parenting patterns instead of giving way to freedom of choice at every step? Unconsciously, we may be following 'rules' set by society about what our kids 'should' be doing, especially when it comes to milestones, academics, and hobbies or sport. There is nothing wrong with girls baking or boys playing football, but we should be presenting enough opportunities for the reverse as well, especially when they are older. If our children learn to follow their heart instead of following others, we will have more creative and unique individuals amongst us. And by this, I don't mean that they should be self-centered, but that they should recognise and cultivate their inner happiness. I don't know if it was by their choice, but the way my parents raised me, I'm pretty competent at making my own decisions. I don't feel the need to ask for directions or affirmations in my life, though I welcome advice when it is offered. I realise that this is a good quality to have. It gives you confidence in yourself and the choices you have made. It also makes you responsible for them. As a mother, I want to teach my son to think for himself. I want to involve him in decisions that may appear easy for me, but will open up his mind. I want him to believe that he's doing something that he wants to instead of being told to. I want him to know that he has a choice. That things don't always have to be a certain way because someone said so. I want him to know that he can make his own path if none are offered. I wish he doesn't worry about making an 'unpopular' choice just because it is different, as long as it is his. I would like to tell him that instead of worrying about what others think, he should just think and allow his mind to roam free. I want him to care for others, and be so caring that he can be truly himself with them instead of living up to an unreal image. So dear Little Dude, don't forget to listen to your heart. and you can paint any picture you choose to. First off, Tarana so happy that you are co-hosting with us this week and want to thank you for joining us. Second, I love what you won't compromise on and I am a true believer myself in wanting my kids to be able to think freely for themselves. My parents always told me growing up to be a leader not a follower. I didn't always get the importance of this, but now I do and hope to god to teach my girls how very important and valuable it is to indue shave their own minds and not just follow what others do or think. It's a pleasure, Janine! Thinking independently is so important, and I'm glad to hear your parents stressed on this too. I feel exactly the same way. I have never been one of those helicopter parents, guiding my children's every move. Thinking for yourself is a learned skill that can only come when kids are allowed to stand up and say what direction they want to go in. They still need our guidance, of course, but we can't let ourselves forget that they are individuals in their own right and not just extensions of us. You described it perfectly, Kat! That's how I feel too, although I can be a 'helicopter parent' sometimes when I'm feeling anxious. Teaching our kids to follow their heart rather than follow the crowd ... that's one of the most important things we can do! Loved this post, Tarana!! I think that this is such an important lesson to teach your child, and you are modeling it yourself as well. We won't be there to hold their hands forever, and raising an independent, free thinking person is one of the best things we can do as parents. Yes to letting our children make unpopular choices if they are their choices. 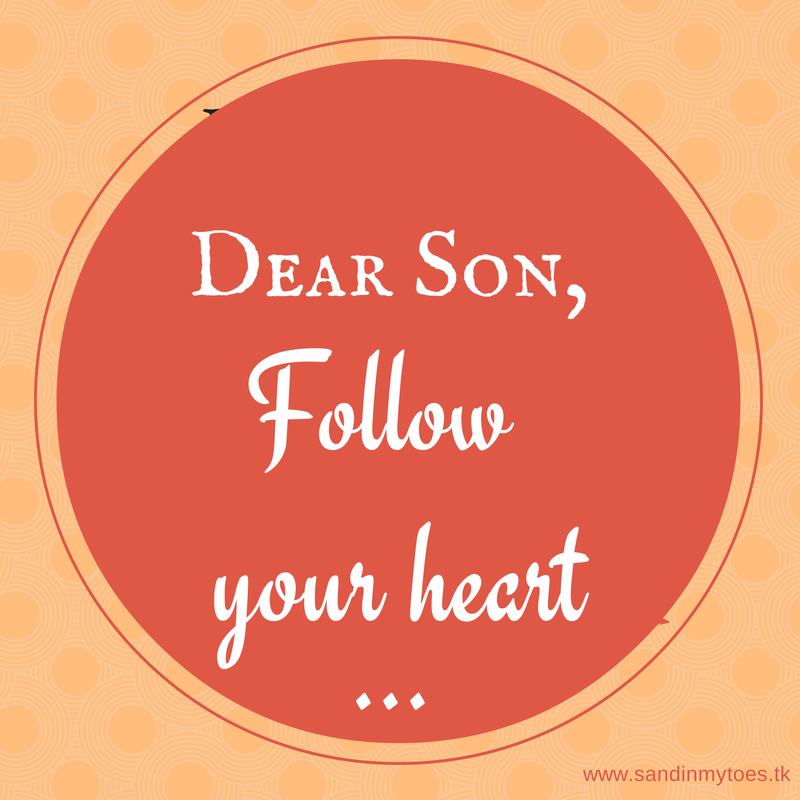 It took me a really long time to feel confident in my decisions and I so hope that I help my son to have the confidence and bravery to follow his own heart. Such great advice and thanks so much for co-hosting with us this week! Found you through the FTSF link up and absolutely loved your post. It is so important to follow through on who we are! Good job on raising your son to think that way and I hope more parents follow in your footsteps! I too, hope that my son (and daughter) will be strong enough to listen to their hearts. Mine are 16 & 18, so the decisions are starting to get tougher and I'm hoping they continue to stay the course. This was a lovely post, your son is lucky to have such a wise mom. You totally have it right- teaching our kids to think for themselves is SO important. And also- I am the ONLY FTSF host who consistently forgets to link to the guest co-host! Please forgive me!! We are so happy to have you! Hi Tarana: I loved this line: "I want him to care for others, and be so caring that he can be truly himself with them instead of living up to an unreal image." It expresses a wonderful aspiration for Little Dude, and he will thank you one day (if not already) for helping him grow into a happy, healthy adult because of it! I love this. All I want is for my kids to be whoever they want to be, be it a mime or physicist. That's right, Dana, independent thinking is such an important and understated skill. Thank you! I think it's one of the things we don't really think about because as parents, we are programmed to make decisions for our kids. Yes, they are at that age when their decision making skills will really be tested, even though they will still need guidance. Thanks! Totally okay, happens to all of us! I agree with your perception, Tarana. We gotta be their guide,but in the end they ought to find their path towards happiness. Thanks Ruchira, I love this linky too! Such an important message Tarana. I couldn't agree with you more. I've worked hard to instill that in both my kids. It's doable. My guys are 18 and 20 now and are capable of making up their own minds. It's so rewarding to see. I like this because I think we all have a number of things that are different, not mainstream, that we want to do, but often feel pressured to not do them because we won't fit in. I did this a number of times growing up. I don't know if it depends on the temperament of the child or how they're raised or both, but it's definitely something I want my children to not struggle with. Great to hear that, Kelly! I hope my little guy grows up to be like that too. Yes, temperament probably makes a difference, but I would at least like to encourage being different, if that's what they want to do. It's not always easy going against the grain. It's definitely not easy, Chantelle, but I'll try to do what I can to guide him in that direction. It's not going to be easy, but I hope he learns to follow his heart sooner than later. Thank you! It is a scary world for sure, and one where it's hard to be different. But in the end, that's how we an be happy. Thanks Jenny! Sometimes we forget what we really want, but at least we can remind our kids, right? I know, it's not going to be easy making decisions, it never is. As a mom, I can only hope I can guide him in doing what makes him happiest! But thank you for the reminder. I love this so much Tarana!! I try my best to truly inspire my kids to be WHO they want to be, and I am so proud of the choices they have made so far in defining who they are. We tend to be naturally controlling as adults, but we just need to keep reminding ourselves to let the kids go a bit! Glad to know you think this way too, Chris!